Ilias Kasidiaris, a Greek MP and the official spokesman for Greece’s far-Right Golden Dawn party, is being hunted by police after repeatedly slapping a female political rival in the face on live television as a debate on the hotly-contested 17 June election re-run became extremely heated. The Times (£) reported that “shocked staff” at the private television station Antenna escorted Kasidiaris off the set and locked him in a room at the TV studio, “but he broke down the door and escaped.” He is now a wanted man after a Greek prosecutor issued a warrant for his arrest for attempting to inflict dangerous bodily harm, which carries a sentence of up to ten years in jail. During a round-table discussion, Rena Dourou, a member of the left-wing Syriza party, criticised Golden Dawn, declaring that Kasidiaris’s party “will take the country back 500 years.” A visibly enraged Kasidiaris called her “a joke,” and flung a full glass of water into her face. When Liana Kanelli, a Communist party deputy, intervened on Dourou’s behalf, throwing a newspaper at Kasidiaris, he totally lost it. He jumped from his chair, called her a “Commie” and pushed and slapped her. It is so far unclear how the ugly incident will impact on Golden Dawn’s electoral prospects. The party, which has 21 MPs, won its first parliamentary seats in Greece’s inconclusive general election on 6 May. The Times (£) reported that other parties have vowed to boycott future TV debates with Golden Dawn members. “We are urging citizens who voted for Golden Dawn to reconsider,” said Fofi Gennimata, a spokeswoman for Pasok, Greece’s main Socialist party, quoted in The Times (£). 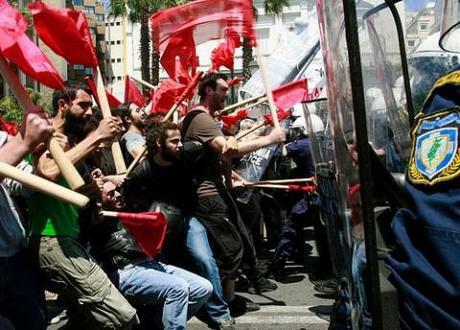 Golden Dawn said in a statement on its website that Kasidiaris had been provoked. “If anybody wants us to condemn our party fellow over this, indeed unfortunate moment, they should first condemn Kanelli’s attack and slandering,” the party insisted. “The government condemns in the most categorical way the attack by Golden Dawn spokesman Ilias Kasidiaris against Liana Kanelli and Rena Dourou. This attack is an attack against every democratic citizen,” said a statement by the Greek government, quoted by Gawker.